Helium is one of the basic chemical elements. In its natural state, helium is a colorless gas known for its low density and low chemical reactivity. It is probably best known as a non-flammable substitute for hydrogen to provide the lift in blimps and balloons. Because it is chemically inert, it is also used as a gas shield in robotic arc welding and as a non-reactive atmosphere for growing silicon and germanium crystals used to make electronic semiconductor devices. Liquid helium is often used to provide the extremely low temperatures required in certain medical and scientific applications, including superconduction research. Although helium is one of the most abundant elements in the universe, most of it exists outside of Earth's atmosphere. Helium wasn't discovered until 1868, when French astronomer Pierre Janssen and English astronomer Sir Joseph Lockyer were independently studying an eclipse of the Sun. Using spectrometers, which separate light into different bands of color depending on the elements present, they both observed a band of yellow light that could not be identified with any known element. News of their findings reached the scientific world on the same day, and both men are generally credited with the discovery. Lockyer suggested the name helium for the new element, derived from the Greek word helios for the sun. In 1895, English chemist Sir William Ramsay found that cleveite, a uranium mineral, contained helium. Swedish chemists P.T. Cleve and Nils Langlet made a similar discovery at about the same time. This was the first time helium had been identified on Earth. In 1905, natural gas taken from a well near Dexter, Kansas, was found to contain as much as 2% helium. Tests of other natural gas sources around the world yielded widely varying concentrations of helium, with the highest concentrations being found in the United States. During the early 1900s, the development of lighter-than-air blimps and dirigibles relied almost entirely on hydrogen to provide lift, even though it was highly flammable. During World War I, the United States government realized that non-flammable helium was superior to hydrogen and declared it a critical war material. Production was tightly controlled, and exports were curtailed. In 1925, the United States passed the first Helium Conservation Act which prohibited the sale of helium to nongovernmental users. It wasn't until 1937, when the hydrogen-filled dirigible Hindenburg exploded while landing at Lakehurst, New Jersey, that the restrictions were lifted and helium replaced hydrogen for commercial lighter-than-air ships. During World War II, helium became a critical war material again. One of its more unusual uses was to inflate the tires on long-range bomber aircraft. The lighter weight of helium allowed the plane to carry 154 lb (70 kg) of extra fuel for an extended range. After the war, demand for helium grew so rapidly that the government imposed the Helium Act Amendments in 1960 to purchase and store the gas for future use. By 1971, the demand had leveled off and the helium storage program was canceled. A few years later, the government started storing helium again. As of 1993, there were about 35 billion cubic feet (1.0 billion cubic meters) of helium in government storage. Today, the majority of the helium-bearing natural gas sources are within the United States. Canada, Poland, and a few other countries also have significant sources. Helium is generated underground by the radioactive decay of heavy elements such as uranium and thorium. Part of the radiation from these elements consists of alpha particles, which form the nuclei of helium atoms. Some of this helium finds its way to the surface and enters the atmosphere, where it quickly rises and escapes into space. The rest becomes trapped under impermeable layers of rock and mixes with the natural gases that form there. The amount of helium found in various natural gas deposits varies from almost zero to as high as 4% by volume. Only about one-tenth of the working natural gas fields have economically viable concentrations of helium greater than 0.4%. Helium can also be produced by liquefying air and separating the component gases. The production costs for this method are high, and the amount of helium contained in air is very low. Although this method is often used to produce other gases, like nitrogen and oxygen, it is rarely used to produce helium. There are several methods used to upgrade natural gas. When the gas contains more than about 0.4% helium by volume, a cryogenic distillation method is often used in order to recover the helium content. Once the helium has been separated from the natural gas, it undergoes further refining to bring it to 99.99+% purity for commercial use. 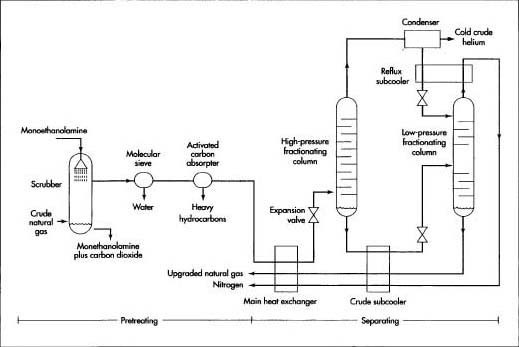 Here is a typical sequence of operations for extracting and processing helium. Because this method utilizes an extremely cold cryogenic section as part of the process, all impurities that might solidify—such as water vapor, carbon dioxide, and certain heavy hydrocarbons—must first be removed from the natural gas in a pretreatment process to prevent them from plugging the cryogenic piping. 1 The natural gas is pressurized to about 800 psi (5.5 MPa or 54 atm). It then flows into a scrubber where it is subjected to a spray of monoethanolamine, which absorbs the carbon dioxide and carries it away. 2 The gas stream passes through a molecular sieve, which strips the larger water vapor molecules from the stream while letting the smaller gas molecules pass. The water is back-flushed out of the sieve and removed. 3 Any heavy hydrocarbons in the gas stream are collected on the surfaces of a bed of activated carbon as the gas passes through it. Periodically the activated carbon is recharged. The gas stream now contains mostly methane and nitrogen, with small amounts of helium, hydrogen, and neon. All impurities that might solidify and clog the cryogenic piping is removed from the natural gas in a pretreatment process. After pretreatment, the natural gas components are separated in a process called fractional distillation. industry, this process is sometimes called nitrogen rejection, since its primary function is to remove excess quantities of nitrogen from the natural gas. 4 The gas stream passes through one side of a plate fin heat exchanger while very cold methane and nitrogen from the cryogenic section pass through the other side. The incoming gas stream is cooled, while the methane and nitrogen are warmed. 5 The gas stream then passes through an expansion valve, which allows the gas to expand rapidly while the pressure drops to about 145-360 psi (1.0-2.5 MPa or 10-25 atm). This rapid expansion cools the gas stream to the point where the methane starts to liquefy. 6 The gas stream—now part liquid and part gas—enters the base of the high-pressure fractionating column. As the gas works its way up through the internal baffles in the column, it loses additional heat. The methane continues to liquefy, forming a methane-rich mixture in the bottom of the column while most of the nitrogen and other gases flow to the top. 7 The liquid methane mixture, called crude methane, is drawn out of the bottom of the high-pressure column and is cooled further in the crude subcooler. It then passes through a second expansion valve, which drops the pressure to about 22 psi (150 kPa or 1.5 atm) before it enters the low-pressure fractionating column. As the liquid methane works its way down the column, most of the remaining nitrogen is separated, leaving a liquid that is no more than about 4% nitrogen and the balance methane. This liquid is pumped off, warmed, and evaporated to become upgraded natural gas. The gaseous nitrogen is piped off the top of the low-pressure column and is either vented or captured for further processing. Once separated from the natural gas, crude helium is purified in a multi-stage process involving several different separation methods depending on the purity of the crude helium and the intended application of the final product. condenser. Much of the nitrogen condenses into a vapor and is fed into the top of the low-pressure column. The remaining gas is called crude helium. It contains about 50-70% helium, 1-3% unliquefied methane, small quantities of hydrogen and neon, and the balance nitrogen. Crude helium must be further purified to remove most of the other materials. This is usually a multi-stage process involving several different separation methods depending on the purity of the crude helium and the intended application of the final product. 9 The crude helium is first cooled to about -315° F (-193° C). At this temperature, most of the nitrogen and methane condense into a liquid and are drained off. The remaining gas mixture is now about 90% pure helium. 10 Air is added to the gas mixture to provide oxygen. The gas is warmed in a preheater and then it passes over a catalyst, which causes most of the hydrogen in the mixture to react with the oxygen in the air and form water vapor. The gas is then cooled, and the water vapor condenses and is drained off. 11 The gas mixture enters a pressure swing adsorption (PSA) unit consisting of several adsorption vessels operating in parallel. Within each vessel are thousands of particles filled with tiny pores. As the gas mixture passes through these particles under pressure, certain gases are trapped within the particle pores. The pressure is then decreased and the flow of gas is reversed to purge the trapped gases. This cycle is repeated after a few seconds or few minutes, depending on the size of the vessels and the concentration of gases. This method removes most of the remaining water vapor, nitrogen, and methane from the gas mixture. The helium is now about 99.99% pure. Helium is distributed either as a gas at normal temperatures or as a liquid at very low temperatures. Gaseous helium is distributed in forged steel or aluminum alloy cylinders at pressures in the range of 900-6,000 psi (6-41 MPa or 60-410 atm). Bulk quantities of liquid helium are distributed in insulated containers with capacities up to about 14,800 gallons (56,000 liters). Helium is distributed either as a gas at normal temperatures or as a liquid at very low temperatures. cryogenic adsorber operating at about -423° F (-253° C). Purity levels of 99.999% or better can be achieved with this final step. 13 The helium is then piped into the liquefier, where it passes through a series of heat exchangers and expanders. As it is progressively cooled and expanded, its temperature drops to about -452° F (-269° C) and it liquefies. 14 Large quantities of liquid helium are usually shipped in unvented, pressurized containers. If the shipment is within the continental United States, shipping time is usually less than a week. In those cases, the liquid helium is placed in large, insulated tank trailers pulled by truck tractors. The tank body is constructed of two shells with a vacuum space between the inner and outer shell to retard heat loss. Within the vacuum space, multiple layers of reflective foil further halt heat flow from the outside. For extended shipments overseas, the helium is placed in special shipping containers. In addition to a vacuum space to provide insulation, these containers also have a second shell filled with liquid nitrogen to absorb heat from the outside. As heat is absorbed, the liquid nitrogen boils off and is vented. The Compressed Gas Association establishes grading standards for helium based on the amount and type of impurities present. Commercial helium grades start with grade M, which is 99.995% pure and contains limited quantities of water, methane, oxygen, nitrogen, argon, neon, and hydrogen. Other higher grades include grade N, grade P, and grade G. Grade G is 99.9999% pure. Periodic sampling and analysis of the final product ensures that the standards of purity are being met. In 1996, the United States government proposed that the government-funded storage program for helium be halted. This has many scientists worried. They point out that helium is essentially a waste product of natural gas processing, and without a government storage facility, most of the helium will simply be vented into the atmosphere, where it will escape into space and be lost forever. Some scientists predict that if this happens, the known reserves of helium on Earth may be depleted by the year 2015. Powell, Corey S. "No Light Matter." Scientific American (March 1996): 28, 30.